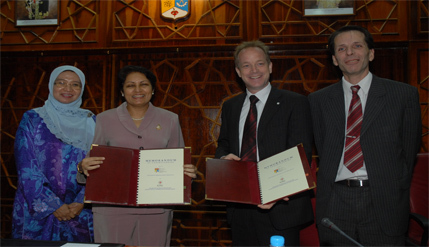 Bangi, 1 Nov 2010 – UKM has expressed the hope that the International Committee of the Red Cross (ICRC) can contribute towards curriculum development in its Law Faculty. Deputy Vice Chancellor (Industry and Community Partnership) Professor Dr Saran Kaur Gill hoped for such collaboration between its Law Faculty and the ICRC which can be manifested through courses on International Humanitarian Law at both undergraduate and post graduate levels including the sharing of knowledge and experiences. She said this at the signing of a Memorandum of Understanding (MOU) between UKM (Law Faculty) and the Regional Delegation of the International Committee of the Red Cross (ICRC) at the chancery here today. 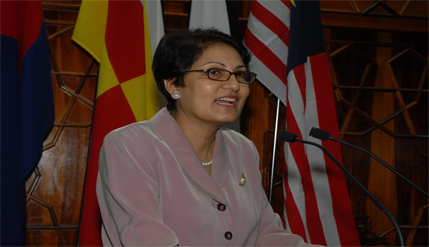 Prof Saran Kaur said such meaningful and sustainable collaboration with the ICRC can enrich education, research and services at UKM. “With this development, the university wish to see more of the international and local students at the faculty to conduct research in uncharted issue of armed conflicts. “These students come from countries that are in conflict situations and are doing their best to find answers that may help if not to solve but will at least mitigate the sufferings of the people in their countries,” she said. Prof Saran Kaur said there was tremendous opportunity to carry out research on humanitarian law in contexts relevant to its postgraduate students. Some of the Law Faculty lecturers also have had their first experience working with NGOs on issues pertaining to asylum seekers in Malaysia involving the Rohingya community. She congratulated the faculty after its legal aid programme for poor communities through the UKM Legal Consultancy Centre had received a grant of RM48,000 from the Ministry of Women , Family and Community Development. The Dean Faculty of Law, Professor Dr Aishah Bidin said although international humanitarian law has yet to be offered as a subject at the faculty, it had already been integrated in various components in the compulsory third year subject on Public International Law (PIL ). She said it was a basic requirement that all its students would have undergone and understood the basic principles of international human rights including substantive human rights (UN Charter, civil, economic and political rights etc) after their third year as well as community oriented human rights, international law of armed conflicts and other fundamental salient features of humanitarian law . “To ensure our students are well equipped with contemporary issues, we believe that the introduction of humanitarian law and human rights law is indispensable and vital to ensure that our students stay abreast with current developments with their peers . “With such important underlying issues governing the legal regime applicable to International Red Cross and contemporary humanitarian law, the Faculty of Law believes that it is vital and important to extend our collaboration with ICRC,” she said. 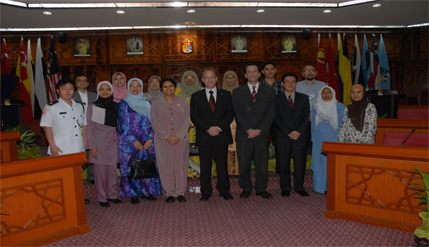 To date, the Faculty had signed various MOUs and letters of intent not only with several universities in United Kingdom,Tasmania, Iran and Indonesia but also with the industry and government organisations in its pursuit to enhance academic excellence in research, student exchange and enhancing academic programmes. A research group from the Faculty is also working on a national survey with the Companies of Commission of Malaysia to evaluate the compliance level of corporate responsibility among various corporate entities in Malaysia. “We also are working with the Attorney General’s Chambers and the Malaysia Bar Council over the setting up of a legal clinic at the faculty. “Discussion are on going for some terms of arrangement for our academicians to go for training with the state legal aid bureaus and the Bar Council. It is our quest that these mechanisms will bring the faculty closer to the community,” she said. ICRC was represented by its Head of Regional Delegation Kuala Lumpur, Mr Tobias Epprecht. Also present was its Regional Legal Advisor, ICRC Kuala Lumpur, Mr Richard Desgagne.